Every once in a while, I feel an urge to return to Tolstoy, to War and Peace or to Anna Karenina. It’s a pleasure I feel I owe myself. Of course, some will tell me that there is no point reading over something I have already read when there is so much out there that I haven’t, but how likely is it that whatever else it is that I may read instead will give me anything like the experience I know I’ll get from re-reading Anna Karenina? I am now in the second of the eight parts of this novel, and am relishing every single sentence. First-time readers have the advantage over the 5th time reader (or is it the 6th? I’ve lost count) in that, not knowing what comes next, they may be taken by surprise, or shocked, or astonished, or whatever. But the truth is, the twists and turns of the plot, such as they are, are no big deal: these are not the elements that confer greatness to a work of literature. When you read actually knowing what comes next, it is actually more rewarding: one catches so many intimations of the future, so many little details the significance of which registers only when one does know what is to come, that it is hard to escape the suspicion that Tolstoy had intended this novel to be read many times over. In the much criticised epilogue to War and Peace, Tolstoy writes an essay musing on the nature of free will. This essay is not arbitrary, as many readers seem to think, and neither is it an aberration, an embarrassing polemic tacked on to a great novel: it is perfectly in keeping with the nature of the book, and, I’d argue, an integral part of it. For, after all, Tolstoy himself had denied that War and Peace was a novel: there is a novel in it, certainly, but the book is much more than a novel, and we should not be surprised if it were to contain elements that do not belong to the novel. In War and Peace, Tolstoy is not merely telling a story: he is speaking to the reader, musing, thinking aloud. And he thinks aloud not merely on why it is that individual characters behave the way they do, but also why it is that people en masse, entire nations, also behave as they do. What are the causes historic events, the great movements in the tides of human affairs? Tolstoy, who attempted, as far as he was able, to penetrate into the reasons for all human actions, refused to allow that anything could be arbitrary. If anything appears arbitrary, it is only because the causal factors are too many, and each one too apparently trivial, for the human mind to take it all in. Each event, Tolstoy felt, was the consequence of a virtually infinite number of infinitesimally small causes; and it is because the human mind is incapable of taking in and processing so much data that the appearance is given of arbitrariness. But it is but an appearance: could we but see through God’s eyes, we would see that all is as it must be, that there is no real free will at all. It is hard to tell to what extent Tolstoy was merely thinking aloud to himself here. I personally don’t think that the conclusion Tolstoy presents in the epilogue to War and Peace is intended to be a definitive statement. Tolstoy knew that definitive statements are not possible given how little we are capable of understanding these matters. But the ideas continued, it seems, to whirl in Tolstoy’s mind: and it seemed particularly to worry him that if humans have no real free will, then they cannot be responsible for their actions, and, hence, cannot be subject to moral judgement. And Tolstoy recoiled at this. It’s a conflict that cannot be resolved: if human behaviour is capable of analysis, there must be reasons behind each action, even though we may not be aware of these reasons; but if each act is an effect of a cause or of causes, then human beings are subject to these causes, and, hence, cannot be free; and hence, they cannot be judged on moral grounds. The premise that Tolstoy insists upon leads to conclusions that he found unacceptable. This conflict echoes throughout Anna Karenina. We start with Oblonsky, Anna’s brother: he is charming, well-liked, and affable, but deeply irresponsible. His household is in turmoil, because his wife – who is worn out with childbearing, and is no longer pretty – has discovered that he has been having an affair. Oblonksy had meant no harm: he is honest enough to admit to himself that he no longer loves his wife, but he wouldn’t deliberately have wanted to hurt her. Even so, he is incapable of imagining what she is going through, and he tells himself, quite honestly and quite sincerely, that he couldn’t help it – that it wasn’t really his fault. We see his wife, Dolly, and she is quite clearly a tragic figure. Her life is a meaningless and endless stream of household chores, and, though aged only about thirty, she is worn out, both physically and mentally. She knows that she is no longer beautiful, and no longer loved; she knows she is utterly humiliated; and yet, she also knows that there is nowhere, absolutely nowhere for her to go. With the advantage of knowing what is to come later, we know that there will come a time when will fantasise about leaving her husband and family, as Anna had done. Dolly, in short, is every bit as tragic a figure as Anna is: Anna’s tragedy is that of a woman who leaves her family, and Dolly’s tragedy is that of a woman who doesn’t. But to what extent is any of this anyone’s fault? Soon, there is a ball, and Anna discovers to her delight that the handsome Vronsky is besotted with her. Anna too has fallen in love with him, and, without quite knowing why, she finds herself exhilarated by the awareness of what Vronsky feels for her. And she knowingly makes the most of her considerable sexual appeal to hook Vronsky. She knows that, as a married woman, she shouldn’t do this; and she knows also that in doing this, she is cruelly destroying the hopes of the innocent Kitty, who had hoped that Vronsky would propose to her. The next morning, Anna feels ashamed of what she has done; but, like her brother, she tells herself that she couldn’t help it: it was not her fault. Throughout the novel, people act as they do without quite knowing why: no-one, it seems, can help what they do. And even as they act foolishly, or selfishly, or maliciously, or meanly, they seem driven by forces beyond their control: they all rush headlong into an uncertain future that is a consequence of their actions, but which they cannot hope to foresee. Life seems almost to shape itself around them without anyone realising quite why, or how. Tolstoy was not writing a treatise on free will; and he was certainly not insisting, as he had appeared to do in the epilogue of War and Peace, that free will is illusory. Anna Karenina is prefaced enigmatically by a quotation from the Bible: “Vengeance is mine, and I will repay”. Actions have consequences: people are responsible for what they do, whether they like it or not, and, the clouds that gather over this novel’s landscape are dark indeed. Throughout, there is a sense of terror that lies immediately beneath the fabric of our everyday lives. The first part of the novel is masterly. In one long, unbroken narrative arc, lasting over a hundred pages, Tolstoy brings together all the major characters, takes us into their minds as only he could do (no other writer I have come across can enter with such apparent ease the minds of so many different types of people), depicts their various milieux, introduces all the themes of the novel – and all with such seeming ease that one is left thinking that if novel-writing is really so easy, why can’t everyone do it? At that very moment the wind, as if it had overcome an obstacle, showered down the snow from the carriage roofs and rattled a loose sheet of iron while, somewhere ahead, the deep whistle of the engine gave a mournful and gloomy wail. And obstacle is suddenly overcome; and a sheet of iron is rattled. This imagery of the iron, and of the “iron roads”, we know, continues. Anna later has a recurring dream that frightens her, in which she sees a peasant, sometimes in her very bedroom, doing something with some iron and muttering incomprehensibly in French. And of course, in the extraordinary climactic passage of the novel, as Anna throws herself under a train, a “little peasant, muttering something, was working over some iron”. One could, of course, analyse precisely what the symbol of the iron represents, what the railway (“iron road”) symbolises, and even, perhaps, why the peasant was muttering in French, but such a Spark’s Notes approach to great literature tells us little: the important point is that Tolstoy is constructing his novel in terms of emblems and motifs that bind together the vast material. Working out the various symbolic correspondences – even assuming they exist in the first place – is less important than appreciating the psychological import of these motifs. Richard Strauss once said about Mozart that he cannot speak about him coherently – that he can merely worship. I know how he felt, for I feel the same way about Tolstoy: every time I try to articulate what it is about him that means so much to me, I find myself floundering. As I am reading this, I am exclaiming with admiration at every page. In all literature, it’s this novel, War & Peace, and about a dozen or so Shakespeare plays that mean most to me personally. (Throw in the Sherlock Holmes stories, and I think I could be quite content just reading and re-reading only these books for the rest of my life.) I seem to be re-living this book rather than just re-reading it. Quite a few years ago now, on an internet book group that is now defunct, I led a group read of War and Peace, and had written summaries of each part as I was reading. (I have put these summaries up on this blog.) I think I will start to do the same for Anna Karenina. Watch this space, as they say. “I have been told,” Eudora Welty writes in the introduction to the volume of her Collected Stories, “both in approval and in accusation, that I seem to love all my characters.” Never having read anything by Welty before, this very statement made me warm to her: for if a writer dislikes her characters, or even hates them, then she is unlikely, I think, to produce fiction worth reading. Or, at least, unlikely to produce fiction that I, for one, would want to read. For why should one waste one’s time, either as writer or as reader, on matter that one dislikes, or even on matter that one hates? Fiction that proclaims merely how depraved human beings all are seem to me merely embittered. Of course at the other extreme, one runs the risk of being merely sentimental; but given a choice between the embittered and the sentimental, I’ll take the latter. Of course, there are different ways of “loving [one’s] characters”, and they need not all be sentimental. It may be argued that even Flannery O’Connor, who unremittingly presented humanity in its fallen, graceless state, loved her characters, but that her love was what we call a “tough love”: for all their severe moral and spiritual shortcomings,her characters are still creations of God, and as such worthy recipients of Divine Grace. But there is a coldness to Flannery O’Connor’s writing: she observes humans in a cold and objective light, and judges them severely, never encouraging in the reader sympathy or even empathy for any of them. The stories are certainly very impressive, and made on me a tremendous impact; but after spending so long with them, I found myself longing for a depiction of humanity that is less harsh in its judgement, that is more prepared to accept us even in our flawed and fallen state. Such a perspective is alien to O’Connor’s sensibilities, as acceptance of a fallen state renders superfluous the concept of Divine Grace; but to a writer such as Welty, not obviously tied to any religious ideology, acceptance of humans even in their fallen state can come more naturally. And no, it need not be sentimental. What I do in writing of any character is to try to enter into the mind, heart, and skin of a human being who is not myself. Whether this happens to be a man or a woman, old or young, with skin black or white, the primary challenge lies in making the jump itself. It is the act of a writer’s imagination that I set most high. Nowadays, the act of a writer’s imagination that is often set most high is the act of imagining worlds different from our own, but I am with Eudora Welty on this: it is the act of imagining this world – not other worlds, but this one – from the perspectives of other people that constitutes the supreme act of a writer’s imagination. It is this ability, more than any other, that confers upon great fiction its greatness. The Golden Apples, published in 1949, and often reckoned to be Welty’s masterpiece, is a sequence of seven interlocking short stories, which, regarded as a whole, effectively forms a novel. This sort of novel in mosaic form is so rich in possibilities, one wonders why it isn’t done more often: the only other example I can think of off the top of my head is Go Down, Moses by William Faulkner, although, no doubt, there are more I cannot think of right now. Here, Welty uses the form to depict a community of people over several decades, with the various characters moving in and out of focus in the different stories, and shown from different perspectives. All but one of the stories take place in the fictional southern town of Morgana – a reference, I gather, to Fata Morgana, a type of mirage that takes its name from the enchantress Morgana la Fay in the Arthurian legends. There are many other references to mythology throughout: the Golden Apples of the title refer at different points to the golden apples of Atlanta in Greek mythology, and to the golden apples that provided eternal youth to the Norse gods, etc. etc. There are many references too to Celtic mythology, and to Yeats’ early poem The Wanderings of Aengus, in which Aengus searched for “the silver apples of the moon, and the golden apples of the sun”. I must admit, though, that, being relatively unfamiliar with many of these mythologies, these references did all too often pass me by: no doubt a better awareness of them on my part would have added greater resonance. But even without this added resonance, the mythological qualities of the work are apparent. In the first story, King MacLain walks out on his wife Snowdie. They meet again some time later, and Snowdie is left from the encounter pregnant: she later gives birth to twin boys, Ran and Eugene. King MacLain himself becomes a sort of mythological figure, appearing enigmatically at unexpected times, and giving rise to various stories told about him – some true, some partly true, some pure fantasy. Even without any identification with Wandering Aengus or with Zeus, King MacLain becomes a mythological figure. Only in the very last story, we see him as an old man, aware of his mortality and awaiting death like any other flesh-and-blood human: this view of him as a frail human should not be shocking: all flesh, after all, decays and dies; but it does, somehow, come as a shock to see this Zeus-like figure reduced to mere flesh and blood. This seventh and last story in the sequence, “The Wanderers”, focuses on the transience of humanity, and on mortality: at the centre of it is the funeral Katie Rainey, who had been the narrator of the first story. After the funeral, in one of the most moving pieces of prose writing I have encountered, Katie’s daughter, Virgie, reflects on the past, and takes leave of her home town. Miss Eckhart, whom Virgie had not, after all, hated – had come near to loving, for she had taken Miss Eckhart’s hate, and then her love, extracted them, the thorn and then the overflow – had hung the picture on the wall herself. She had absorbed the hero and the victim and then, stoutly, could sit down to the piano with all Beethoven ahead of her. With her hate, with her love, and with the small gnawing feelings that ate them, she offered Virgie her Beethoven. She offered, offered, offered – and when Virgie was young, in the strange wisdom of youth that is accepting of more than is given, she had accepted the Beethoven, as with the dragon’s blood. That was the gift that she had touched with her fingers that had drifted out of her. Between King MacLain’s deserting his wife, and Virgie’s sad contemplation, there are five other stories, ranging in mood and content. Two of these stories centre around King MacLain’s twin sons. “The Whole World Knows” centres on Ran, whose wife, once his childhood sweetheart, is now openly unfaithful to him. He longs for a reconciliation that he knows is impossible, and begins an affair with a girl who resembles his wife a she used to be; and, in the presence of this girl, he attempts suicide. Afterwards, he has disturbing fantasies of murdering his wife. (In the final story, we learn in passing that the girl with whom he has this affair had herself committed suicide afterwards.) The other twin, Eugene, has left Morgana and settled in San Francisco: he is at the centre of possibly the most enigmatic story in this sequence – “Music from Spain”. His marriage, too, is in crisis: years earlier, their only child, a girl, had died, and the grief has now taken a form that is driving him apart from his wife. The story begins with husband suddenly, and for no apparent reason, striking his wife. He does not know why he does this; he would, indeed, have thought himself incapable of such an act, and is himself shocked by his action. That day, instead of going to work, he wanders aimlessly around the streets of San Francisco, accompanied by a Spanish musician with whom he cannot communicate, as neither can speak the other’s language. There seems to be a moment of near-revelation that afternoon on the beach, although what precisely is nearly revealed remains mysterious. In the final story, at Katie Rainey’s funeral, we see Eugene again, now split up from his wife, and back in his hometown: it does not surprise us. In both these stories involving the unhappy marriages of the MacLain twins, there is a figure, almost a godlike figure, it seems, who, perhaps like God himself, remains conspicuous by his absence: and that is the father of Ran and of Eugene, the mythical King MacLain. And when this God-like figure reappears in that sad final story, he is all too human. These stories of lost love and of loneliness; of the exuberance and energy of youth, the disillusion of adulthood and of the sadness of old age; of the changes wrought by time and of the growing awareness of mortality; are all written in some of the most exquisite prose I have encountered. Indeed, much of it requires the sort of close reading one normally reserves for poetry. And throughout it all, there is apparent the author’s completely unsentimental love for her characters, a love that comes from “enter[ing] into the mind, heart, and skin” of other people: as Eudora Welty rightly says, the ability to do this is the highest act of a writer’s imagination. A single reading of a book as complex and as multi-layered as this is by no means enough: but it does give me an impression, at least, of the riches on offer, and I know I shall be returning to this quite extraordinary book. Recently, English translations of three Bengali novels have been published in the West – My Kind of Girl (Moner Mato Maye ) by Buddhadeva Bose; The Tale of Hansuli Turn by Tarashankar Bandopadhyay; and the classic novel Kapalkundala (translated as The Forest Woman) by the 19th century author Bankim Chandra Chatterjee. I must confess to having read none of these, either in Bengali or in English: it is not easy to immerse oneself in the culture of a country one had left behind at the age of five, and while I have tried, I won’t pretend that I have always tried my best. But I draw attention to these publications because I cannot help wondering whether this may, in its own modest way, represent the first stage of the turning of a peculiar cultural tide: for some decades now, Indian literature has come to mean in the West works written in English, in imitation of Western writers, and aimed primarily at a Western readership: writing in Indian languages* is barely so much as acknowledged. The long-term effect of this can only be that aspiring writers in India will tend to write in the only language that offers an opportunity to access an international market: if this is indeed, the case, then the future of literatures in Indian languages seems very bleak indeed. And to what extent the considerable literatures that have already been produced in Indian languages will be read and remembered – who knows! In this context, the translation of some highly regarded writings from Bengali – and, more importantly, their publication in the West – is to be welcome, even though Hesperus spoil the effect somewhat by the cover design of The Forest Woman: putting on the cover of a Bengali novel a picture of a Rajasthani woman is about as daft as putting a picture of a Viking warrior on the cover of Walter Scott’s Rob Roy. But let us not carp too much. That translations from Bengali are now being made available in the West is something to cheer, and one can only hope that further translations from Bengali literature (and, also, from the literature in Indian languages other than Bengali) will now follow. Let us hope that this current state of affairs can now begin to change, and that, in time, Indian literature will mean something more than merely the writings of Rushdie & co.
* Nowadays, Bengali is thought of exclusively as the language of Bangladesh, so, at the risk of stating the obvious, it it perhaps worth pointing out that Bengal comprises not merely of Bangladesh, but also of West Bengal, which has been part of India since the inception of the country; and, as such, Bengali is also an Indian language. Of course, the distinction between Bangladeshi and Indian is irrelevant if we are speaking of times preceding partition in 1947. 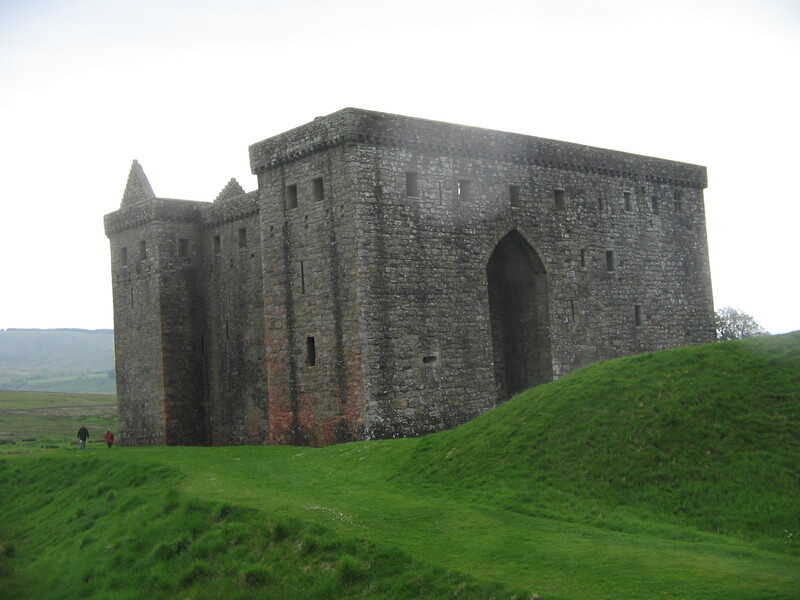 Some fifteen or so miles south of the town of Hawick, just a few miles on the Scottish side of the border, broods the sinister ruin of Hermitage Castle. All around is the most desolate landscape imaginable – bleak, bare moorland. I had always wondered what Shakespeare had meant by a blasted heath, and I am still not entirely sure, but whatever he may have meant, this heath was blasted. The day we visited it, a cover of grey rainclouds screened out the sun. Somehow, I cannot imagine the sun ever shining on this dismal place. The building itself is as harsh and grim as the isolated surroundings – a rectangular, uninviting block. The castle … unable to support the load of iniquity which had long been accumulating within its walls, is supposed to have partly sunk beneath the ground; and its ruins are still regarded by the peasants with peculiar aversion and horror. And I spoke, some days after our visit here, to an employee of Historic Scotland who had previously worked at the ticket office of Hermitage Castle: Historic Scotland, he told me, does not like to publicise stories of the supernatural relating to the various sites that they own and look after, but many people have felt some sort of presence at Hermitage, and teams of researchers into psychic phenomena have visited that place to conduct various experiments. 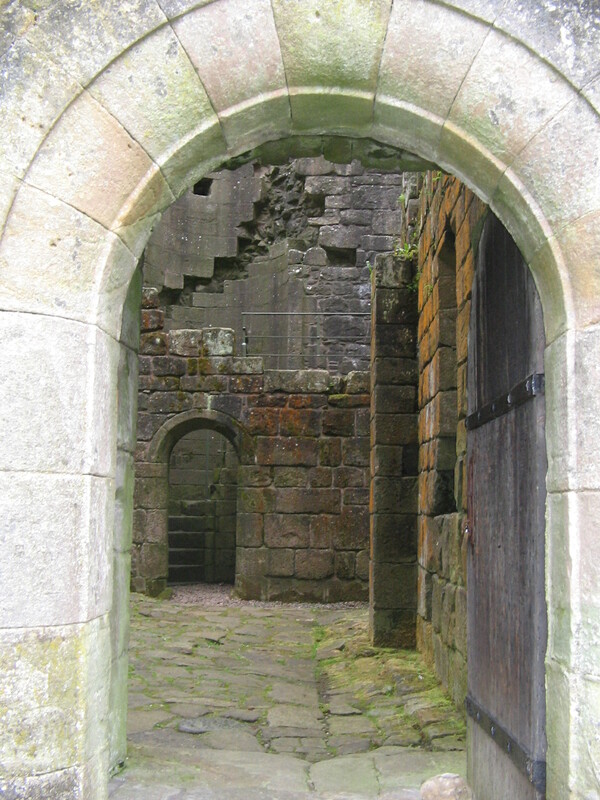 I ventured that the intense atmosphere of Hermitage Castle is likely to make the mind more susceptible to present fears and horrible imaginings; he agreed, but added that when he had to lock up at the end of the day, as darkness was descending, he could not, for some reason, lock up and get into his car quickly enough. I could believe that easily enough. For my rational comment did rather bypass a fundamental question: yes, it is indeed true that an oppressive atmosphere could render the mind more susceptible to fantasy; but what creates that oppressive air in the first place? That I do not know. Of course, as a rational person – as I like to think I am – I am not for one moment suggesting that the place is haunted: but I cannot explain the sense of dread that I know I felt there. Of course, there are many stories about the place. Some of them are even true. 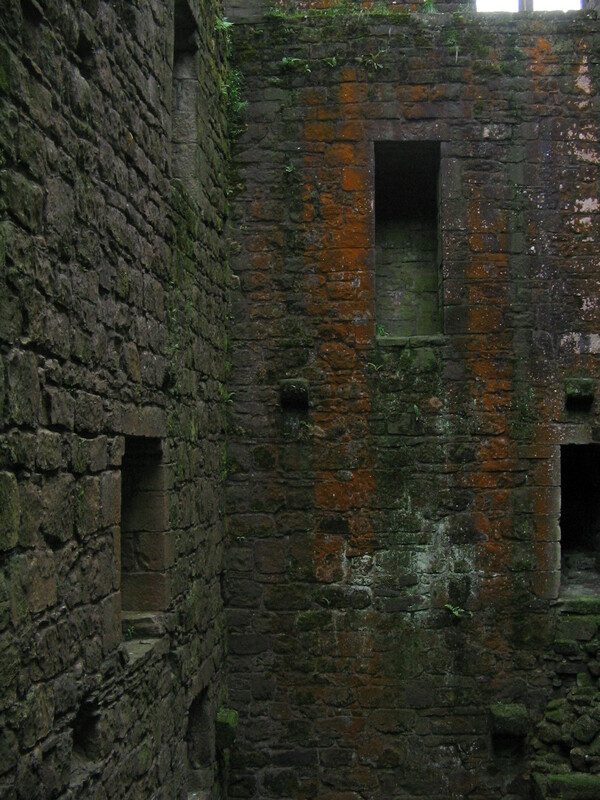 It is certainly true that there was a foul and airless dungeon, lacking air, light or sanitation, and that people had been starved to death there: but medieval dungeons never were pleasant places, and dungeons boasting similar stories may be found in many castles throughout the British Isles. And there is also the story of Sir William de Soulis, who owned the castle during the reign of Robert the Bruce: he is reputed to have been a practitioner of the black arts who kidnapped and then murdered little children in his unspeakable rites, until, one day, the local populace stormed the castle, captured him, and threw him into a cauldron of boiling water. Great story, but, sadly, complete nonsense. No doubt Sir William may have dabbled in alchemy – as many did in medieval days – but there were no sadistic rituals, no slaughtered children: instead, he was charged by Robert the Bruce with treason, imprisoned in Dumbarton Castle, and there, rather mundanely, he died a natural death. I mean, he wasn’t even beheaded, or anything like that. But the story of the black arts and the slaughtered children persists, and has the merit at least of deserving to be true. That this story is but a myth does not detract from the impression made by the place. 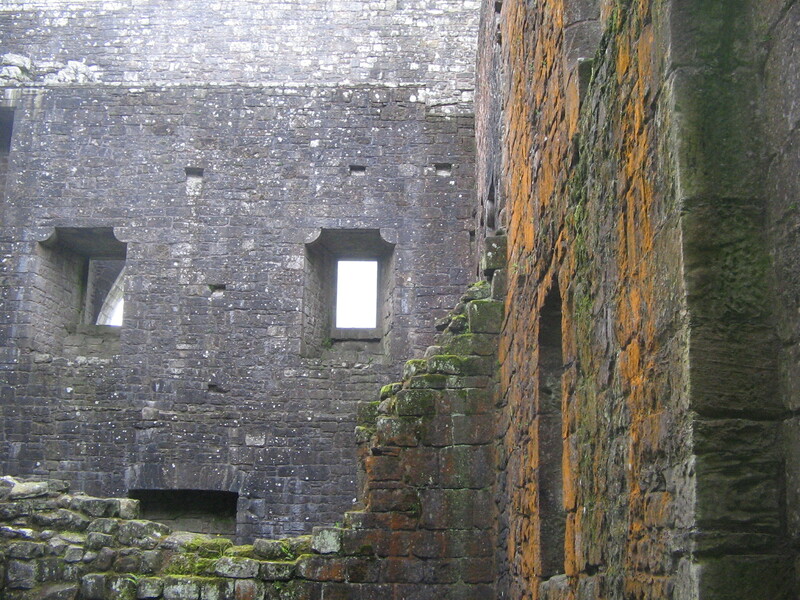 Inside the castle was just as nightmarish as the outside. The roof is now no more: it is open to the skies. 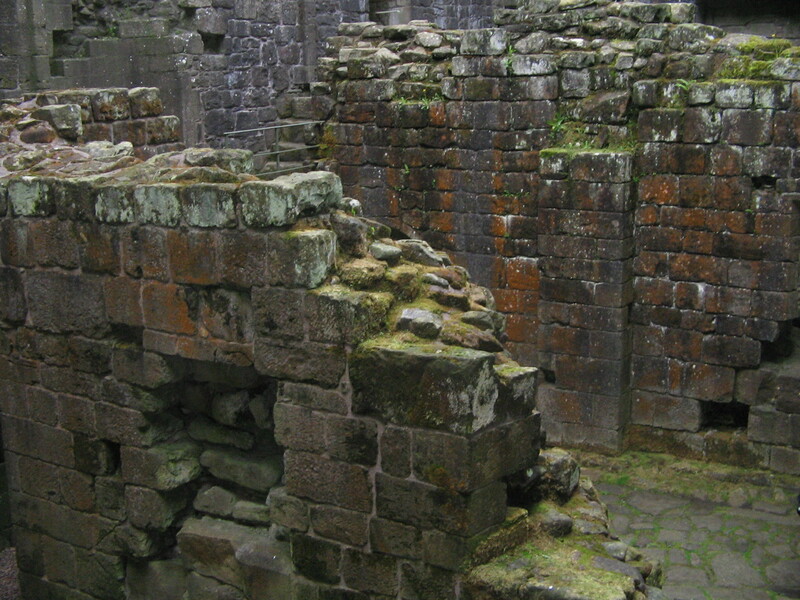 But even so, it feels claustrophobic inside; it feels as if those ruined, moss-clad walls of dark stone were, somehow, threatening to close in on one. Is it too fanciful to imagine that the very stones seemed to resent my presence? Yes, of course it is. But fanciful or not, that is how I felt, and, as I sit now in my own room back home, typing into my PC with a civilised dram of malt whisky within easy reach, I cannot account for what I had felt when I was there just a few days ago.